When Theresa Ward had her first child 14 years ago, the Pittsburgh mom followed the pediatrician’s recommendations and fully vaccinated her son on schedule. But when the boy turned 3, Ward began to worry about risks associated with vaccines, like fever or rare, but serious allergic reactions. She also feared autism. Ward, now 30, began refusing booster shots for the toddler and when she later had two more children, they went unvaccinated. Because she refused vaccination, several pediatricians in the area turned her away, concerned about the risk it could pose to their other very young patients. Ward finally landed at a pediatrician’s office in East Pittsburgh that didn’t mandate vaccinations for patients. Instead, over the course of several years, the doctor maintained an open dialogue with Ward. That doctor’s patience paid off. In 2016, after a 10-day trip to India, Ward’s perspective on vaccines began to change again. Seeing how people suffered from preventable diseases, as well as the lack of access to basic health care, Ward realized her internal conflict about vaccines was self-centered. “We have a responsibility for the greater good of the world,” Ward said. When she returned from India, she went straight to her pediatrician to get her three children up to date on their shots. When her fourth child was born, she vaccinated him on schedule. While the overwhelming majority of Americans choose to have their children vaccinated, the number of children who go completely unvaccinated is rising. The most recent estimate from the U.S. Centers for Disease Control and Prevention show that in 2017, 1.3 percent of toddlers haven’t had a single shot, more than quadruple the 0.3 percent rate in 2001. Ward’s story hints at the time and intensity of care that may be required to counsel a hesitant parent about vaccines. But as outbreaks of measles continue in the U.S., doctors and public health experts are realizing that there is a lot they don’t know about the most effective methods to counteract the anti-vaccine movement. We have no coherent program for vaccine communication. 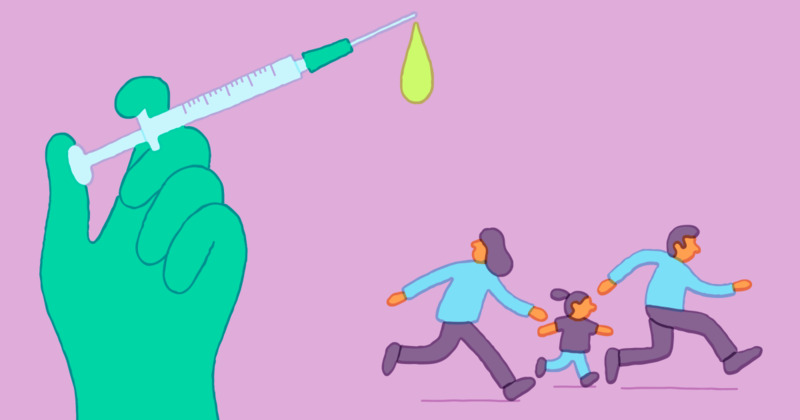 Vaccine safety and effectiveness have been studied for decades, but research on how to talk about vaccines, and how to increase vaccine acceptance, is still in its infancy. In the midst of the measles spread in the U.S., doctors and public health workers are learning on the fly what works, and what doesn’t, when it comes to communicating with vaccine-hesitant parents and communities. And the little that is known has yet to “scale up,” or spread to every single doctor’s office and local public health department, said epidemiologist Dr. Saad Omer, a vaccine and infectious-disease expert at Emory University in Atlanta. “We have no coherent program for vaccine communication,” said Omer. Omer and Wiesman both testified before a Senate committee hearing on March 5 to call for more funding for vaccine communication research to combat the spread of anti-vaccine messages. The lack of a standard operating procedure for vaccine communication is apparent in the ways individual municipalities choose to respond to the current outbreak of measles. After an outbreak of measles in Rockland county, New York, local officials issued a temporary 30-day ban on unvaccinated children from public gathering spaces. The controversial policy was seen as aggressive, but resulted at least 700 additional mumps, measles and rubella vaccinations through free clinics, according to the Rockland County Department of Health. But the move caused an outcry from the area’s Orthodox and Hasidic Jewish community, and a state judge issued a preliminary injunction against the ban on April 5. It’s too soon to know if public bans like Rockland’s are effective in increasing vaccination rates, Omer said. Wiesman declined to specifically comment on Rockland’s ban, but said that if public health were adequately funded in the U.S., there would be no need for such orders. “If we get people vaccinated, we don’t need to be focused on these kind of efforts, which are pretty disruptive to people’s lives and really don’t serve anyone well,” Wiesman told NBC News. One effective technique, called motivational interviewing, requires a skilled facilitator to use empathy and active listening to connect with parents who might be angry or scared about vaccines. It’s what Siman Nuurali, a healthcare coordinator at Minnesota Children’s hospital, used during the height of the Minneapolis 2017 measles outbreak. The Somali community in Minnesota used to have high vaccination rates, on par with the general population. But in the early 2000s, those numbers plummeted, going from 91 percent in 2004 to 54 percent by 2010. Experts attributed the decade-long decline to anti-vaccine groups claiming childhood vaccines were causing their children to develop autism. Nuurali and Somali-speaking coworkers attended community meetings at mosques to speak out against the anti-vaccination groups who had infiltrated Minneapolis’ Somali community. Nuurali also actively tried to reach families of unvaccinated children. Nuurali learned which statements shut down a conversation, and which led to an appointment for vaccinations. She found that starting with, “the MMR shot does not cause autism,” derailed the discussion. With the efforts of the Minnesota Department of Health, Minnesota Children’s hospital, Nuurali and others, Somali children under age 6 saw a 262 percent uptick in MMR shots from April to August 2017 — the length of the measles outbreak — compared to the year before. Omer isn’t surprised at Nuurali’s experience. There is already some evidence that streamlining the process can make a difference. Research shows when there is a standing order for vaccines in a patient’s chart that allows nurses, midwives, pharmacists or physician’s assistants to give the shot, not just the doctor, people are more likely to get their vaccines. Initial research also suggests when physicians use language with patients that presumes they will receive vaccines (“Well, we have to do some shots”), as opposed to using language that seems to ask for participation (“What do you want to do about shots?”), more families accept vaccines, said Omer. In order to reach vaccine-hesitant parents, public health professionals and researchers have to first stop demonizing them, said Melissa Carrion, an assistant professor of technical communication at Georgia Southern University. The next step is to sit down with parents, one-on-one, a difficult task, considering that physicians aren’t reimbursed for vaccine counseling, she said. In a 2017 study, Carrion conducted 50 in-depth interviews with mothers like Ward who chose not to vaccinate their children. A few were completely dug into their position, but Carrion found most were simply looking for health care providers to address their concerns. This matches Ward’s experience. She talked with a pediatrician she had trusted for years, and who had put in the time to answer her questions. NBC News contributor Anna Almendrala is a health journalist and former creator and host of Webby-nominated IVFML, a HuffPost podcast about infertility. Follow or contact her at twitter.com/annaalmendrala.